"This is no raft floating on a warm sea. Keep your strength. It's the only chance against this cold." There's nothing quite like a taut adventure film. Setting men against the odds with little hope of success, equipped with nothing but their grit and unspoken bonds is to me when cinema comes alive. Adventures captivate and catapult the audience, putting us on the edge of our seats and delivering a line of thrills and, perhaps, even an intelligent theme. 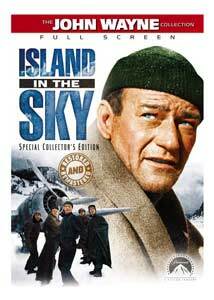 Based on a novel by Ernest K. Gann, Island in the Sky tells the story of ordinary men under extraordinary circumstances. Capt. Dooley (John Wayne) and his crew are flying cargo for the Air Transport Command shortly after World War II. While struggling through unmapped territory, the plane's navigator, Murray (Jimmy Lydon), misplaces their position. A blizzard rages, causing the plane to ice up. Dooley and co-pilot Frank Lovatt (Sean McClory) search for an open spot where they can crash land. Through a haze of snow, they see a rupture in an unending array of trees. They land safely, though it is uncertain whether anybody knows where they are. While Dooley and his men are left to combat the environment having minimal supplies that must last them roughly a week before they can expect any help to arrive, the call goes out for other pilots to head a rescue mission. Stutz (Lloyd Nolan) heads one plane, McMullen (James Arness) and Moon (Andy Devine) another. They surmise a strategy to find the men, but it's all just a shot in the dark. Nobody's ever flown this path before and a major storm is on its way in. Not only are they attempting to save a fellow pilot and his crew, but these men need to protect their own lives in the minus-70-degree climate. The story shifts between the rescue mission and the stranded crew. Thanks to the mechanical genius of engineer D'Annunzia (Wally Cassell), Dooley is able to make brief contact with the rescue team. Whether it's enough for them to lock in on his exact position in unknown terrain, well camouflaged by Canada's forests, remains a mystery. Dooley organizes his men, trying to keep them calm in the face of death. What's most effective about the film is its attention to detail. Every little fact brims with authenticity, thanks in part to real life aviator Gann adapting his own novel into this razor-sharp screenplay. The dialogue is effective and concise, being punctuated by the excellent cast. Some claim that John Wayne is not a great actor, but his work here clearly demonstrates otherwise. There's a mixture of emotion here, not just his tough guy persona. Balancing despair, hope, and tenacity, Wayne gives one of his best performances. Equally effective is Sean McClory, whose Lovatt begins to go crazy with hunger and fear. A young James Arness is convincing as the tough-as-nails McMullen and Andy Devine's turn helps bring a lighter side to this gritty movie. Wellman is perhaps the forgotten master of Hollywood directors. His work here is quintessential, moving the story along quickly and paying attention to the needs of his actors. Although it's an adventure film, Wellman wisely understands that special effects cannot sustain an audience and places most of his emphasis on the characters. We get to know these men and become invested in what happens to them. The spectacle here isn't the airplanes (although William Clothier's aerial cinematography is spectacular) but the men who fly them and desperately await them. Island in the Sky is a fantastic movie, one that until this DVD release had been out of circulation and practically unknown. Seeing it for the first time, I felt invigorated by its swift storytelling and gorgeous black-and-white images. Containing a highlight in John Wayne's acting career, this is a classic must-see for all his fans. Image Transfer Review: The original 1.33:1 black-and-white picture looks amazing. Deeply textured blacks and excellent contrast sell this picture, even though its detail is not extraordinary. Depth is very good and the picture is crystal clean. Nice job! Audio Transfer Review: The mono mix preserves the original theatrical soundtrack quite nicely, without any hiss or crackling. Dialogue is crisp and well balanced within the mix. The music and sound effects come across nicely, as well. 1 Feature/Episode commentary by Darryl Hickman, Vincent Longo, James Lydon, Leonard Maltin, William Wellman, Jr.
Introduction by Leonard Maltin—a video introduction by film critic Leonard Maltin to the DVD. Newsreel Footage of Premiere—vintage footage from the film's 1953 premiere. Introduction to Gunsmoke TV Promo—John Wayne makes an address in honor of the program's debut. Extras Review: Like their other installment in The John Wayne Collection, The High and the Mighty, Paramount gives Island in the Sky: Special Collector's Edition an impressive set of special features. Like the other title, things start off with an Introduction by Leonard Maltin (03m:58s). He talks about it being based on a real World War II story and gives a preview of the extras, so it's a nice segue into the movie. Following that is a feature-length audio commentary by Darryl Hickman, Vincent Longo, James Lydon, Leonard Maltin, and William Wellman, Jr. Each man participates actively in the commentary, offering a lot of information about the production, people, or history of aviation. The men are clearly having fun while recording this, which makes it both an informative and enjoyable listen. There's also a multi-part documentary, The Making of Island in the Sky that can be played all together or separately. The first part, Dooley's Down (08m:07s), contains interviews with cast and crew members, as well as William Wellman, Jr. The story of how Wellman took it to Wayne is relayed, building upon things said in the commentary. It's a quick but entertaining featurette. The second part is Ernest K. Gann: Adventurer, Author and Artist (18m:45s) goes quickly through the life of writer Gann, chronicling his personal and professional accomplishments. The feature makes good use of his home movies and still photographs in telling Gann's life. You'll find this featurette also on The High and the Mighty: Special Collector's Edition DVD, but it's quite interesting and, dare I suggest it, Gann's life would make for one helluva movie. Continuing on with the larger documentary, Flight School: The Art of Aerial Cinematography (05m:57s) is an interesting look at the William Clothier's work on the film. Talking with veteran aerial cinematographer David B. Nowell, he explains the processes used and its amazing how much of Clothier's technique is still in play today. There's also a rather interesting anecdote about the shoot included here as well. The final part of the making-of documentary is The John Wayne Stock Company: Harry Carey, Jr. (07m:47s). It's an interview by Maltin of Carey, talking about his career and relationship with Wayne. There's an interesting discussion of The Searchers, so make sure to check this out. Moving on, Flying for Uncle Sam (08m:44s) is a brief overview of the Air Transport Command that the US started during World War II. It's quite short, so there's not much covered here, but using newsreel footage this gives an adequate introduction to those not familiar with the Air Transport program. Following that is the film's theatrical trailer as well as Newsreel Footage of Premiere (00m:47s). Like most old premiere newsreels, it's just a quick mentioning of who was there. There's also an Introduction to Gunsmoke TV Promo, with Wayne recommending the show to viewers. Furthermore, there's a brief Photo Galley containing conceptual art, publicity stills, and memorabilia photos. Rounding out the supplemental materials are two promotional trailers, one for Paramount's John Wayne Collection and the other a Batjac Montage of upcoming DVDs from the production company. These concluding extras are typical, but welcomed. What a wonderful rediscovery. Island in the Sky is a great movie, even if it isn't the most original story in the world, and it works thanks to director William A. Wellman, writer Ernest K. Gann, and the cast (especially John Wayne). The collector's edition DVD is another impressive product from Paramount, with a great restoration and solid extras.